Animal lover? Brace yourself for Laure de Clermont-Tonnerre’s feature directorial debut, The Mustang. As explained in the opening title cards, wild mustangs freely roaming the United States are being threatened by overpopulation, limited resources and also the privatization of public lands. 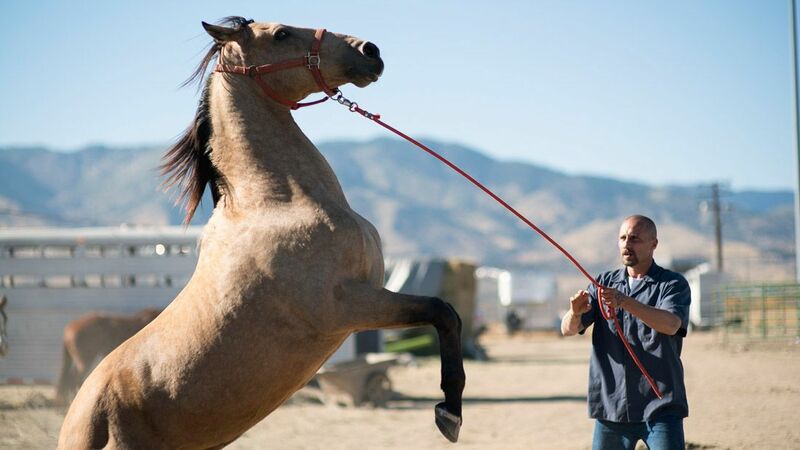 As a form of population control, the federal government rounds up thousands of these mustangs a year, transports them to holding facilities and then some, typically those that are too sick to be adopted, are euthanized. But, a few hundred of them are actually sent to prisons and there, they are trained by inmates and put up for sale at public auction. 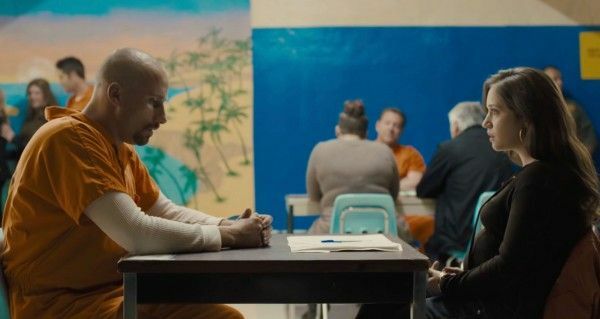 In The Mustang, we meet Matthias Schoenaerts as convict Roman Coleman just as he’s moved from solitary confinement at a maximum security prison to a prison located in the Nevada desert. He isn’t comfortable rejoining the general population and also isn’t thrilled about his new job assignment either – cleaning up after the facility’s wild mustang training program. But, things change when Roman is given the opportunity to train his very own horse, Marcus. You may have a general idea of where The Mustang is heading based on that short synopsis alone, but it’s powered by a truly phenomenal performance by Schoenaerts, and so much care and sensitivity from Clermont-Tonnerre that it’s emotionally spellbinding from the moment Roman meets Marcus. If you need further proof that Schoenaerts is a riveting lead, look no further. He’s delivered in every film I’ve seen him in, but his work here truly rocked me to my core. At the start, Roman is stone cold, distant and extremely hotheaded. In fact, there’s one early scene with Roman and Marcus that’s so upsetting, I caught myself wondering if Schoenaerts would ever be able to redeem Roman for me. Not only does he accomplish that, but he does it with such grace and subtlety that it becomes an overwhelmingly honest transformation. And it’s not one that comes easy for him either. As far as the predictable nature of the film goes, that’s restricted to the side-by-side growth of Roman and Marcus. Similar to Roman, Marcus is confined, angry and violent, and the challenge posed is for the two of them to trust each other. What makes The Mustang a standout though is the nuance that comes with almost every single step of that journey together, a journey that inspires both to open up, socialize and connect. Jason Mitchell is another bright spot in the movie as an inmate named Henry. Henry’s far more experienced in the training program and is one of the first to take Roman under his wing. Not only is his chemistry with Schoenaerts a real charmer, but Mitchell also has the timing, delivery, and charisma to get you to crack a welcomed smile when you least expect it. There is one noticeably weak component of the narrative overall that involves Henry and Josh Stewart‘s character that doesn’t quite pack the punch the filmmakers likely intended, but regardless, Mitchell still manages to make a strong impression. And the same goes for Bruce Dern as Myles as well. He’s the head of the mustang training program and often pressures Roman more than most, but the rewarding flip side to that is that when Myles applauds Roman’s work, Dern ensures it really means something. Another name well worth highlighting here is Gideon Adlon who steps in as Roman’s daughter. She made some noise last year with the comedy Blockers, a movie that suggested all three young leads (Adlon, Kathryn Newton and Geraldine Viswanathan) were well worth keeping an eye on and for Adlon, The Mustang further suggests that she’s a rising star the industry is lucky to have. Her character here is challenged to reconnect with her father over the course of the film, something that can’t be achieved simply by Roman doing a good deed but rather, a component of the film that’s addressed with a thoughtful complexity. And on the topic of rising talent, The Mustang better put De Clermont-Tonnerre on the map. The Mustang is an extremely well directed movie, and a wildly impressive feature debut. The camerawork suggests that she knows her story and characters inside and out. Her visuals give the film a naturalistic vibe that enhance the experience tenfold. She also has a real knack for seamlessly guiding your eye through her frames, and most are doing much more than just showing you the main action. For example, the way she isolates Roman in certain scenes speaks to how he’s feeling, and mirrors his ups and downs throughout the story. The Mustang turned out to be such a wonderful, extremely heartfelt surprise. I thought I had the entire narrative mapped out within minutes but between De Clermont-Tonnerre’s deft touch and the unforgettable lead performance from Schoenaerts, they were able to subvert most of my expectations, not with dramatic twists and turns, but with simple human understanding and emotion. It never makes excuses for Roman’s crime but it does challenge him to be a better person through a program that can make a real difference.